Do pests still need to be monitored and protocols followed if a grower is NOT going to China? Regardless of the market, AvoGreen monitoring will always cover monitoring pests for all markets including those for China and compliance of records to the AvoGreen Monitoring Protocol. Growers should be speaking to their exporter about their plans for exporting fruit to China. Additional requirements for China include defined pest management requirements when AvoGreen pest thresholds for China pests are exceeded (Section 9 of the AvoGreen Manual). Any Grower who is not meeting these management requirements or does not want to respond to pest thresholds within the specified time periods will not be eligible for the China market. What do we do about mealybug and scale insects as there are no industry approved sprays? There are a range of products registered for use in avocados that have label claim for these pests on other crops. While NZ Avocado explores label extension to cover these pests on avocados, many of these products will target mealybug and scale insects when they are used against the label claim pests for avocado if the application coincides with vulnerable life stages or infestations of these pests. If application is for mealybug/scale insect control only, NZ Avocado has a dispensation process for the application of products “off label” in extenuating This can be done through an email to spraydairy@nzavocado.co.nz, ensure you include PPIN, pest, situation, intended product to be used and a copy of the monitoring results. What is the required AvoGreen paperwork for growers (in general as well as for China)? Registered for AvoGreen monitoring with an Operator or as an Owner Operator in the NZ Avocado system. A copy of the agreement for pest monitoring if using an Operator. A copy of the Owner-operator licence agreement with (NZ Avocado) and pest monitor certificate of the person doing the pest monitoring if working as an Owner-operator. A copy of the Growsafe certificate of sprayer spraying your orchard. A Monitoring Plan with ALL of the details completed (or a copy of the agreed plan with the Operator). A monitoring schedule developed for the applicable season for self as an Owner operator or for the Operator you have engaged. An up to date orchard map where blocks match the spray diary and AvoGreen Sample areas are indicated. All Monitoring Results (including those where no pests were detected or when no pest thresholds were met) not meeting threshold. A copy of all pest monitoring results are sent to the packhouse on a monthly basis NB: These results will be required to be recorded in the new industry spray diary when. Evidence of actions (spraying or monitoring) when thresholds are met. Evidence of use of appropriate chemical against the pest threshold indicated in the monitoring results. If applying spraying the orchard is done by the owner an agrichemical inventory must be immediately available (as per GAP requirements). Is it worth exporting to China and when will growers see the value coming in? As a long term risk management approach the avocado industry exporters have identified there is a need to diversify our markets to reduce reliance on a single market. China’s pest risk assessment has identified a number of pests of concern across a number of crops in China. The ones included in the avocado programme were identified as a risk on the avocado export pathway and therefore require specific management to reduce the risk of them getting into China. Put simply –they were not necessarily focussed just on avocado pests but pests that could be found on avocado orchards that may affect crops in their country. There is a concern that the report for China doesn’t have beneficial insects and a lot of growers like to know what good bugs are in their orchard. There is a requirement that AvoGreen recording sheets have a number of critical fields included. Operators and Grower will always retain the ability to monitor and report on other insects present when monitoring, including beneficial insects and observations and comments fields exist on the current approved form. Where AvoGreen Operators are choosing to customise their forms they must be confirming through NZ Avocado that the critical fields are included. Why isn’t there one report that all AvoGreen monitors use so everyone in the industry has the same one? NZ Avocado has an industry approved monitoring sheet that has been uploaded to the AvoGreen section on the website that should be used by all monitoring staff. If an Owner-operator or an Operator wishes to use a report in a different format, they have to have this approved by NZ Avocado. How do we monitor for thrips, both Green House Thrips (GHT) and Flower Thrips (FT)? All thrips at all life stages either have market access or crop protection implications and therefore must be monitored for. Monitors will not be able to distinguish between the juvenile stages of GHT and FT. The presence of juvenile thrips is to be recorded under THRIPS. Where an adult FT is clearly identifiable this is to be recorded in the FT column and calculation. Please see below. Knowing if there is mixed populations is critical so the presence of whether there is both juvenile and adult thrips should be made in the observation or comment fields. In regards to the requirements for China, what does it mean to do a re-monitor if a pest threshold is met or exceeded for china? This concept of monitoring if no spray is applied is confusing. Firstly, if you are always responding to a threshold by spraying within 28 days of monitoring, you will always be compliant for all markets including China. If you choose not to spray in response to a threshold being met or exceeded, there are re-monitoring options that must be under-taken to be compliant for China. When an unmonitored spray is applied, where do the monitors write this? Sprays are not the monitor’s responsibility – it is the grower’s responsibility to document all sprays in the electronic spray diary. The grower’s responsibility is to demonstrate that all sprays have been applied as a results of a threshold being met or as a justified other situation. If LR are found in a pre-harvest quarantine monitor and the grower doesn’t spray as the fruit is due to be harvested, is there any point in monitoring? All pre-harvest quarantine monitoring results are to be submitted to the packhouse. Leafroller is a quarantine market access pest and the packhouse has to actively make a decision on how they manage that fruit. Many small growers are finding it too overwhelming now to undertake the monitoring themselves. NZ Avocado value the role that Owner operators and pest monitors play in the AvoGreen programme and often these are the best monitors for the business as they are on the orchard all of the time. NZ Avocado is increasing the frequency of training and access to training material to assist growers who want to continue to monitor We are happy to assist and support anyone who is committed to the programme to become compliant and carry out the requirements of the programme with ease. What monitoring sheets can be used? A component of the new environment will be the requirement of standardised documents and traceable version along with clear evidence of monitoring records. One way to do this is to use the monitoring sheets provided by the NZ Avocado. If you wish to use documents other than the AvoGreen templates, there is a requirement that these documents are reviewed and signed off by NZ Avocado. All documentation must have document control (e.g. version numbers ). What must Operators have for each grower that they monitor? A copy of the agreement for the pest monitoring service they are going to provide to each grower- dated as of Nov 1 of applicable year and confirmed annually thereafter (grower must have a copy on file). A copy of the Operator licence agreement with NZ Avocado. Copies on file of current pest monitor certificates of accreditation of all the monitors doing pest monitoring for their business. A monitoring plan with all of the details on the form completed by November 1 and confirmed annually thereafter (the grower must have a copy of this on file). A written monitoring schedule developed for the applicable season that indicates the key orchard activities (the grower must have a copy of this on file). An up-to-date orchard map where blocks match the spray dairy and AvoGreen Sample areas are indicated (the grower must have a copy of this on file). All monitoring records, including those were no pests were detected or when no thresholds were met, are available for audit. 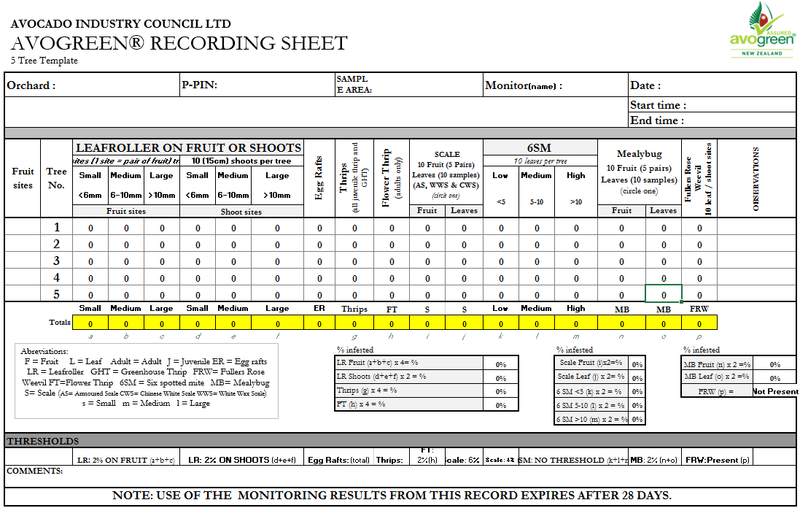 Monitoring results are available and on the growers file and can be linked back to associated monitoring record. What will be required by monitors and operators? Pest monitor will be required to be upskilled to a level that they can respond accurately in an audit situation to all pest monitoring questions and the AvoGreen process offered up by the auditors. Operators must ensure that Monitors, where necessity dictates, know which growers are registered for China export programme and receive a copy of the pest monitoring results so that under the China OAP they are aware when a further pest monitoring may be The Operator can appoint a person or adopt a process to achieve this. How will we register to pack for China? All Packhouse facilities intending to pack avocados to China must register for this programme and submit their application to NZ Avocado by the 31st of July each year. If a Packhouse intends to withdraw from the China programme or make changes, the Packhouse must provide written notification to their IVA and NZ Avocado within 24 hours once export season has commenced, otherwise within five working days. Where can these registration forms be found? How will growers eligible for China export be chosen? It is recommended to segment those growers who do not spray or respond to pest threshold and exclude them from your efforts for China for 2018-19. Focus should be placed on those growers who monitor regularly and manage pests on their crops in timely and compliant manner (i.e. AvoGreen compliant). What is expected of a Packhouse in terms of traceability at packing? Confirm on arrival that every bin received has the correct PPIN. Confirm the supplying production sites are eligible for export under this OAP by checking the production site register on the MPI website. Ensure that inventory records on product identification and traceability from the pack houses are maintained and available for compliance checking by the IVA. Fruit intended for China must be segregated or separated with a physical barrier from non-China fruit at all times (including Class II and processing grade). Ensure that fruit from different registered production sites are packed separately and not combined. Ensure that packed product for China is clearly identified with the correct unique production site identifies and unique Packhouse Any packed product that is not correctly identified is not eligible for this programme. What happens if pests of concern are found on avocados during the packing process for China? If pests of concern are found at packing, the line will be segregated and assessed by the QC for risk. At all times the conservative approach must be adopted and the recommendation is to withdraw the line from China export. The Exporter must be notified. An internal audit of the monitoring results and the spray applications in the spray diary must be reviewed and responded to.